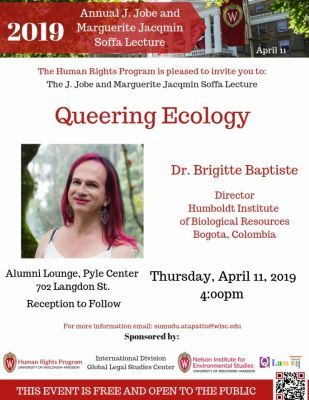 A talk by Colombian Trans and Queer Rights Activist Dr. Brigitte Baptise on Thursday April 11th at the Pyle Center on the UW Campus. Dr. Baptiste will deliver a speech on the importance of queer species in our ecosystem, as well as discuss her work as a trans activist in Bogota, Colombia. This event is free and open to the public. Reception to follow.